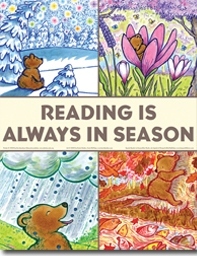 This was originally posted w/some variations on "The Library Lady Rants"
Last fall a librarian from the NY Public Library, currently famed for her blog, prominent in all the kidlit circles, wrote a review of a lovely book of seasonal poetry on Good Reads. It started with her discussing how she had had a patron come in needing books on the seasons to read to a preschool group. A guy who I'd guess has had little experience in reading to a group of preschoolers--perhaps a father doing a "guest reader bit". And she mourned the fact that she didn't have this particular book to give him because SHE loved it so much and "even if the kids were too young to hear all the poems, at least they'd like to hear some of them, and maybe get a little knocked out by the images." Now I try not to snort at this lady too much because she seems like a nice person and I am her "friend" on Good Reads. She's at the heart of the book world and I get a lot of useful stuff from her reviews and posts. I know she is the authority for all things children's librarianship these days, at least according to the Hip Young Librarians, a group to which I never would have belonged to even when I was young. But when she starts talking nonsense like this I can't help rolling my eye and remembering that I have shoes in my closet nearly the same age as she is. That I was doing what she does at the NYPL, (albeit in one of the less prestigious locations), back when she was a 6 year old in Kalamazoo. Yup, I'm that old! In other words, she may have fame but I've got a lot more experience. And she is OUT OF HER TREE to think that this book (recommended, by the way for Grades 2-5) would have worked for an inexperienced reader doing a program for a bunch of preschoolers. Especially in September, early in the school year when a lot of them were likely to be new at just sitting down in a group for a story hour! When you are reading to your own child, or a known child, you can pick something with complicated pictures, with lovely little details to pour over. You can choose complicated verses if your child is the sort who will hold still for poems.You have your child's attention and can go at your child's pace. You don't have to worry about the wiggly little boy who likes to lie down on the rug and flip his feet over his head. You don't have to deal with the two little girls who distract each other at the drop of a hat. Or the one who bursts into tears because he misses his mommy. Or the two moms who are there, but having a conversation unrelated to the story. Or the nanny busy giving her kid a juice box, or <grr> ignoring her charge as she busily texts on her phone. The link is to Amazon.com where you can see a few of the pages. 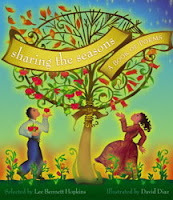 Perhaps if you really do have one of those bright, thoughtful little 4 year olds, you can sit down with them at home on your lap and read a book like "Sharing the Seasons: A Book Of Poems". I mean, it's got poems picked by Lee Bennett Hopkins, the ne plus ultra of compilers of poetry for kids. It's got lovely, slightly abstract illustrations by David Diaz, who won the Caldecott Medal for another book, if such things impress you. But the truth is that though the pictures are lovely, their appeal for young kids is limited. Few of the poems have anything that young kids really relate to, and some go on for a full page. Not a book I'd want to be reading to an unknown group of preschoolers. Okay,now look at Old Bear, the book the "expert" ended up giving this guy. And he was lucky that she had this one instead of the Hopkins book, because THIS is just the right sort of book just right to read to a preschool group! Four excerpts from the book as a poster. "He dreamed that spring had come and he was a cub again. The flowers were as big as trees. He took a nap in a giant crocus"
He dreams of summer, when "the sun was a daisy and the leaves were butterflies", of fall when "everything was yellow and orange and brown, even the birds and the fish and the water" and of winter "It was night, and the sky was blazing with stars of all colors. The cold went on forever". When he finally wakes from his dreaming, he walks into a beautiful spring day. There are no more than a few lines of words per each two page spread, but they are so well chosen, and the illustrations so evocative that they blend together into a book you could read to a group of kindergarten kids or fourth graders, or perhaps even high school students, and each group would get something from it. That's the power of a really good picture book. Most importantly in this case, it has a magic that will work even when this is read by an inexperienced but enthusiastic reader working with a bunch of preschoolers. 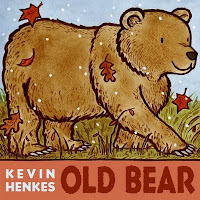 It's the sort of book I choose each week to read to story hour groups ranging from wiggly, barely sitting down 2 year olds (and their ESL nannies)to 4 and 5 year olds that I can work with without a parent in the room. So there's rule #1 for Story Time: look at the books you choose in terms of reading them to a group. It's simple common sense. But what a difference it makes!